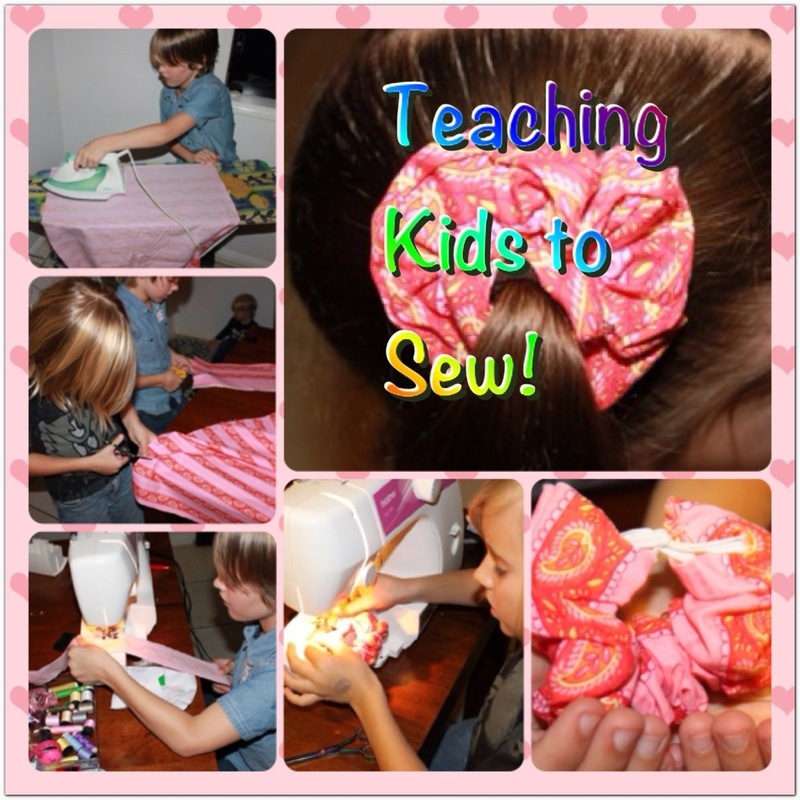 Teaching Kids To Sew – Make a Hair Scrunchie! I was just saying to my other half, I find it odd how many people think the ability to use a sewing machine is something rare or difficult. He agreed that it is very simple, no harder than driving a car. 2 minutes later as I was taking up Miss 4s curtains, I managed to catch the middle of the curtain in the seam, creating a huge unpicking job, and of course my quick-un-pick has grown legs and run off, so I had to do it the hard way. Murphy and his law are cruel, and now I see why many people choose not to sew! That aside, I still think we should all learn the basics of sewing, even if the days of making your own clothes to save money are long gone (fabric is SO expensive!). So when my boys showed interest in sewing after my last little project, I jumped at the opportunity to teach them some basics on the machine. The easiest thing to sew has to be a scrunchie! The process is very straight forward, so I am sure I don’t need to go into much more detail than what is in the caption on the pictures. Apart from a pretty wonky seam by Mr9 (which you can’t notice once finished), they were a success and Ms4 was happy to model their efforts to the world. We used fabric with lines on it as I figured that would be easier to follow for beginners, but you can use just about anything, make them any size and thickness. Gotta love a bit of 90s hair fashion! Where’s the crimper! Love this but I need directions…LOL. My daughter is learning to sew. If you could provide directions for me that would be great.